Well, after much preparation and hype the camper is finally done. It turned out pretty well I think. The blue liners were really nice I thought. They stand out but only to compliment to wood. The mosaic tube from Gene Martin is top flight as well. Worth all $5 per inch. Going to Rising Sun, IN this weekend to work with a good friend and the proprietor of JAAT knives (see the link here at the right) on developing a better sheath technique and this one will be one of the test subjects. I am pleased with it. With the holidays behind me, knife orders under control, and life in general going pretty well I decided it was time to get out for a day. It feels like it's been forever and I was anxious to try at least on of the new spots I had picked during the month running up to squirrels this year. On advantage to hunting Tranquility regularly is that there are literally 100's of places that are easy to get to... especially on days when it is so cold that it hurts to have skin in the wind. Tuesday was like that. The wind was howling up on the field I parked in and snow was everywhere. There was a lot of blowing up in the exposed areas and driving was really, really dicey. My normal 90 minute ride was 3 hours... still worth it though. It was also the first trip into the field for the heavy hunter rifle. While it's pretty darned heavy, it still handles like a champ even in gloves and full winter gear. Based on the two shots I fired, it hits right where it should. Anyhow, it was a strikeout. No squirrels... and not just no squirrels that I could see. No tracks, no noise, no nothing. I was the only thing working in the outdoors this day. One thing about it though. I love the snow and things take on this whole other quality when it's falling. Have as look and take care. This field leads back to the car. As soon as I walked into it, my face chapped. I was so glad to see my car and roll for hom. Excellent day, all around. I've looked high and low for books about William Scagel. Thus far, this one is all I have found... and it's out of print. Fortunately for me, I found a new one anyway. I need to make a note about this upfront because I usually don't discuss the cost of a book but here goes; This is an excellent reference on Scagel however at 24 pages it sorted out at just over a dollar a page for me. Unless you really want to read it, I would advise against buying it. Readability - 5 of 5 - McEvoy does a fine job of covering the life and work of Scagel. In the 15 minutes it took me to read it, I was not bored. Editing - 4 of 5 - Top notch. Production values could be higher but the book is really a long article. It's pretty good, none the less. 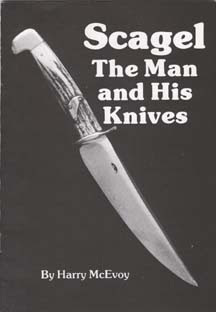 Subject Matter - 5 of 5 - Scagel and knives... what's to say? Did I like the Story - 3 of 5 - I loved it but there could have been a whole lot more of it. It seems there may never be though. It's old and I think everyone involved has passed on. If you are looking for a consolidated, if abbreviated, reference on Scagel this is probably a good place to start. To be fair, what I find after reading this is that I have a stronger desire to do more research. Still a good read though. At this stage, the scales have been cut, attached to black spacers, attached to the blade, profiled (meaning sanded to the shape of the blade looking at it from the side), and I have the rough shaping completed. It looks and feels like a knife at this point. The remaining work is cosmetic and the part that makes a good knife a great one. This is my favorite knife to date. I am pleased with it and will have it complete by Sunday evening. Next comes the sheath and Mr T will need to call me about that when he gets a second. I need to know a color.... :-) Thanks as always for looking.